Then the Holy Spirit made Jesus feel very happy. Jesus said, "I thank you, Father, Lord of heaven and earth. I praise you because you have hidden these things from the wise and smart people. But you have shown these things to people that are like little children. Yes, Father, you did this because this is what you really wanted to do." Joy is the sign of the Spirit's presence (e.g., Rom. 14:17; Gal. 5:22; 1 Thes. 1:6). It was in Jesus' day and it is in our day. 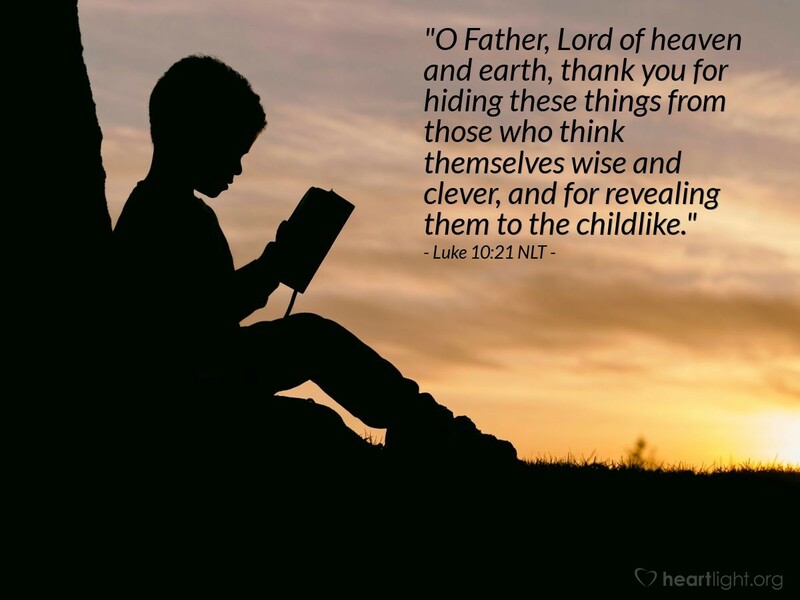 For Jesus, the basis of this joy has to do with God's plan to reveal his truth, grace, and hope to the childlike—not to those the world classifies as wise and clever. Understanding of God's truth is very much like spiritual joy; it is a gift from the Spirit's work in our lives. Holy and loving Father, God all gracious, thank you for giving me your truth and your joy as gifts with the presence of your Spirit in my life. May I never take these gifts for granted! For all of your many blessings and all the varied nuances of your grace, I praise and thank you in Jesus' name. Amen.